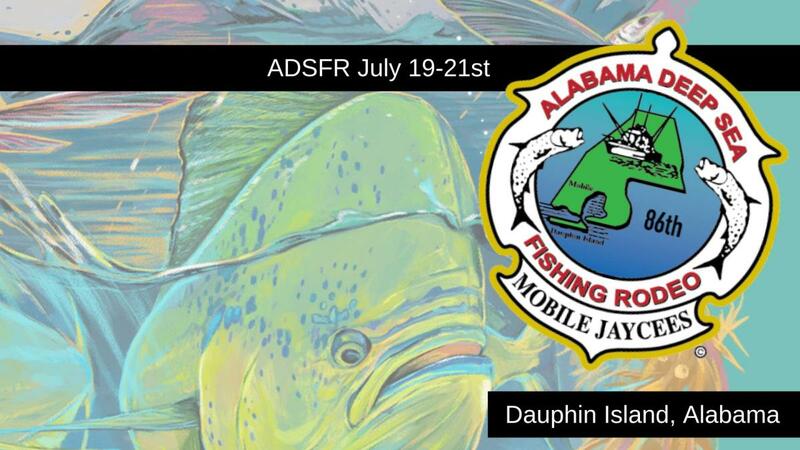 The Alabama Deep Sea Fishing Rodeo, a Project of the Mobile Jaycees, is the largest fishing tournament in the world. Founded in 1929, the fishing rodeo now attracts over 3,000 anglers and 75,000 spectators. It is located on Dauphin Island, Ala. (N30 15'31, 90" W88 06'47.78). The 86th Alabama Deep Sea Fishing Rodeo will be held July 19-21, 2019. The ADSFR is a 3-day Captain's Choice tournament and a Southern Kingfish Association (SKA) sanctioned event. The total awards package is valued up to one million dollars in cash and prizes and anchored by a boat, motor, and trailer packages. The 3-day event features 30 categories with prizes awarded for 1st, 2nd and 3rd place in all categories. One Master Angler is also awarded along with cash prizes for King Mackerel, Speckled Trout and Big Game Jackpots. The ADSFR has donated over $275,000 to the University of South Alabama Department of Marine Sciences and annually funds academic scholarships.